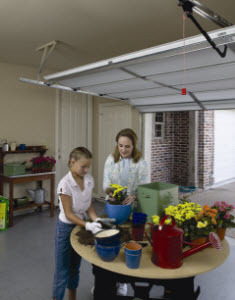 Test your garage door opener’s reversing mechanism monthly by placing a 2 x 4 board in the door’s path. If the door does not reverse after contacting the object, call an authorized Overhead Door Ribbon® distributor at 1-800-929-3667 for professional repair. Use the release mechanism on the garage door opener to manually open the door using its interior or exterior lift handles. The door should lift smoothly with little resistance and should stay open around three or four feet above the floor. If it is difficult to perform this task, your door may be out of balance, causing premature wear. Call an authorized Overhead Door Ribbon® distributor at 1-800-929-3667 for adjustment. Consider purchasing a garage door opener with rolling code technology, which changes the access codes each time the transmitter is used. Overhead Door’s CodeDodger® has been incorporated as a standard feature into our full line of openers since 1995.